Music class, originally uploaded by Venus In Furs. I know it's been a while. It's been a mild but still too chilly to play outside winter. There have been a handful of days in the 50s which we (and every other parent in bay ridge) took full advantage of and ran to the playground and let the kids run free for as long as we could stand. Otherwise we've all been well. Happy, healthy, and all the rest of that. 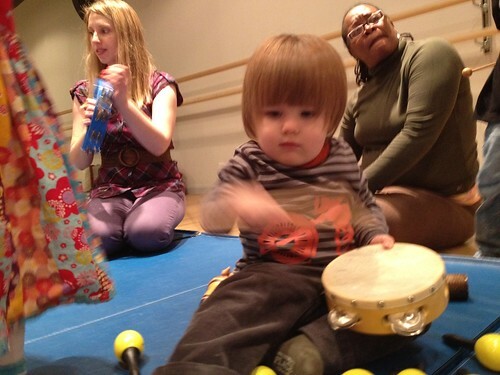 Gibson is taking a music class on Tuesday mornings, which he absolutely loves. There are a handful of other children ranging in ages form about 18 months to about 3 years and really it's a sing-y dance-y bang on instruments kind of time. It's run by 'Music for Aardvarks' and all of the songs are city related and I highly recommend the classes, and our teacher Anna Banana is just wonderful. Gibson understands us very well when we speak to him. If I ask him if he wants to go to music class or to the playground he nods and makes the same sound for yes (it's still not really english 'yes' yet). He says 'no' in quite possibly THE cutest way ever. It's so cute that I don't mind (usually) that he says no even when he doesn't mean it, or when I want him to do something (like sit down rather than stand on a chair). His vocabulary is growing daily, though a lot of the words are still a hybrid of baby-talk-learning-to-talk-english. He likes to come over to me if i'm sitting on the couch and take me by the hand to lead me someplace (either to the kitchen for a snack or to his room to play). He doesn't have another doctor's appointment until the end of March, so no stat updates for a while. More soon, but for now I have to run to the market before it rains. oh, i love it. i have missed seeing the photos of your little man - i'm glad all is well over in bay ridge! Oh Lauren, he is so handsome. I am so looking forward to finally meeting the NYC babies, who, I fear won't be babies by the time I get there. Extra hugs and kisses for his sweet face. Annie please come and visit. I miss you so much and I want to meet your giant little man.